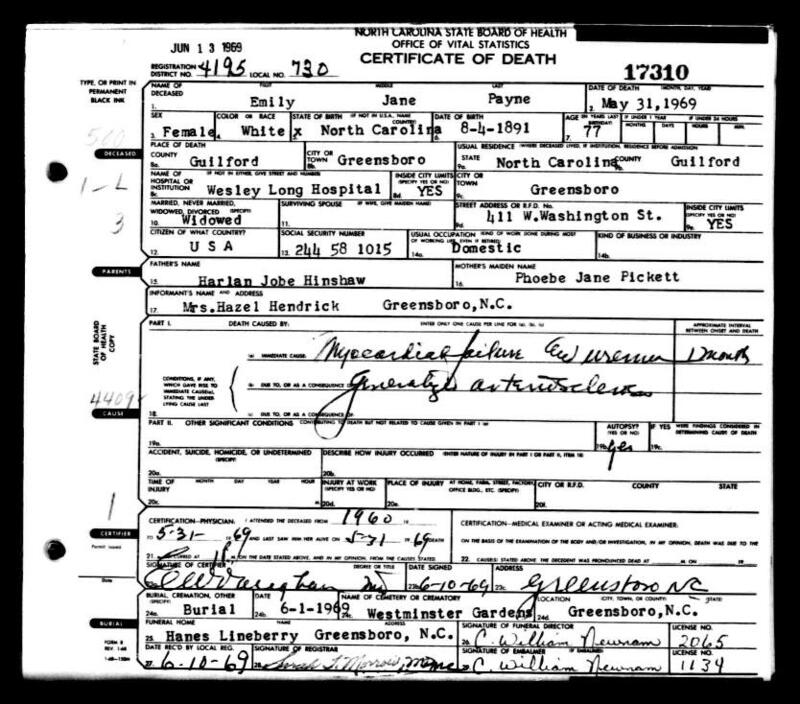 Born Aug 4 18901,2,3 [Aug 4 18914,5,6,7], Asheboro, Randolph County, North Carolina1,2,3. Emily and her sister Bessie married Payne brothers. Hazel Margaret Payne, born Mar 28 1913; died Feb 12 1995; married 1) Jul 27 1927, Norman Lee, 2) Mar 31 1937, Roland Edwards, 3) Feb 6 1943, Henry C. Hendrick. Bertha Mae Payne, born Jan 20 1916; died Aug 6 1999; married Dec 5 1932 John Cameron Hunt, Sr. (Dec 13 1911 - Jun 1 1976). Ollie Marie Payne, born Jun 11 1919; died Sep 13 1973. North Carolina Deaths, 1968-69; http://www.ancestry.com.